Can Nordstrom Credit Card Help Manage Your Financial Future? You are here: Home / Credit Cards / Can Nordstrom Credit Card Help Manage Your Financial Future? If you love to shop, the Nordsrorm credit card is exactly what you are looking for. But it can be confusing these days, as nearly every department store in existence seems to have their own card to offer you. And they all seem pretty similar to each other. And they all look really attractive in terms of what they can offer you. How Can the Nordstrom Credit Card Offer these Kinds of Perks? This can become even more confusing when you decide to sign up for a few different department store credit cards in order to try and maximize the deals you get at the different department stores. And then you are left juggling different cards, different payments and different payment due dates, along with trying to remember the different interest rates each card charges (this can be especially difficult in that department cards charge even more interest than bank cards). It can quickly become a nightmare! That is one of the things separating the Nordstrom credit card from their competitors – they don’t charge outrageous interest rates and the card is truly affordable. There are two specific options that you have when it comes to Nordstrom credit cards: their department store card or their visa card. Their department store card is pretty unique in that the interest rates can be different depending on your credit worthiness – but they also give you reward points. But you get the same rewards with either of the 2 cards – its just that you have more options to use the visa card in more places and locations when it comes to purchases. They can afford to offer these kind of perks on their department store because they issue the cards themselves through their banking division like the military star card payment. But with the amazing discounts that you can receive using the Nordstrom credit card, if you do a lot of shopping this card could be perfect for you. Ok, the thing that I love about Nordstrom credit cards – when you boil it all down – is shopping at Nordstrom Rack. For those of you who have never heard of it, Nordstrom Rack is the huge retailer’s (Nordstrom’s) outlet where they blow out their top-end, designer clothing for clearance prices. So what you can do to save money is go online and search for “Nordstrom rack” to find a location nearest to where you live and then visit the store to see what they are clearing out! But to save even more money, make sure you apply for and receive your Nordstrom credit card and you will save even more money when you use it to purchase your designer discounted items in their store. Really, it’s a win win situation! You get deeply discounted clothing that you want, and you earn reward points, which you can use to save even more money on any items that you purchase! But just don’t buy anything that you can’t afford to pay for (as with any credit card that you get), as department store credit cards such as the Nordstrom credit card often charge a higher rate of interest than other cards do in order to hold your account. So you have to be on top of things when you are doing your purchasing. Don’t go crazy and buy that new pair of jeans if you really can’t afford to pay for them. And by “can’t afford to pay for them” I really mean that you won’t be able to pay for the jeans in full before your credit card payment is due. This is really important to keep in mind with these sort of credit cards such as the Nordstrom credit card, as the interest rate is high, even if they offer you a lower introductory rate. The low introductory rate may only be a couple of percent (or zero percent if you are lucky), but oftentimes what happens is that if you miss even one payment (or are late getting your payment in), you can lose that introductory rate and the interest rate zooms back up to the regular interest rate (which is often in the high 20’s! ), which can make it very very tough to pay off when you are getting charged that kind of interest! I think one of the best courses of action that you can take in this case is to really limit the number of credit cards that you carry. Especially the number of credit cards that you carry from department stores, just for this very reason alone. It can be nearly impossible to pay off a credit card that is charging you 20 percent interest if you only make the minimum payments on the card. But that being said, using your Nordstrom credit card at Nordstrom rack can literally save you hundreds of dollars by the time you add up the savings between the discount on the clothing that you purchase and the reward points that translate into increased savings when it comes to purchases. Also, there is another route to take if you don’t want to pay cash for the discounted clothing at Nordstrom rack (or if you just don’t want to rack up your Nordstrom credit card), and this is by using your Nordstrom credit card for everyday purchases just to get their fashion reward points so that you can use them on your purchases in the store. I throw this one out there because in paying for everyday items using your Nordstrom credit card, it isn’t like you are increasing the amount of money you owe on your card with frivolous purchases. Quite the opposite, as most everyday purchases (like gas, paying your utility bill or other household bills with the Nordstrom credit card) are necessities that you have to pay anyways, but by paying for them in this way, you can earn points as well. And once you have set this system up, earning fashion reward points can be virtually automatic. And in doing this, you can then have even more points to redeem at Nordstrom rack, which saves you even more money. So really, there are a couple of different ways that you can quickly earn fashion reward points using your Nordstrom credit card (remember, any purchases you make in Nordstrom allow you to earn even more points on purchases) whether by purchasing items in Nordstrom itself, or by using it in everyday purchases. But the glorious thing is that once you have discovered Nordstrom rack stores, you can save soo much money off of your original purchase price that you will be blown away. 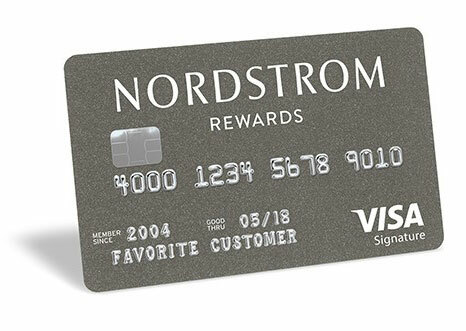 Now its soo much easier to outfit your whole wardrobe with designer items at a fraction of the cost, and when you couple this with the Nordstrom credit card and the additional savings to be had there as well (as long as you use it wisely, as we have discussed earlier) you have a truly winning combination! So if you haven’t already, you need to apply for a Nordstrom credit card and transfer your everyday purchases over to the card so you can start earning fashion reward points while you sleep! You’ll be soo glad that you did.